Homeowners looking for high-quality and safe walk in tubs for their residences in the Minneapolis, Minnesota, area, can turn to the professionals at U.S. Patio Systems and Home Remodeling. We work with only the best products in the industry, which is why we sell and install bathtubs from Safe Step Walk-In Tub Co. 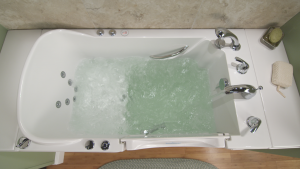 In addition to these great safety benefits, these bathtubs also provide an enjoyable, therapeutic environment – it will be like having a spa right your own home. Air and water jet therapy systems will make you feel like you’re in a hot tub, and the heated seat in all of our walk in bathtubs will ensure you never get too cold. For more information on the walk in tubs we have available for homeowners in the Minneapolis, MN, area, contact U.S. Patio Systems and Home Remodeling today.